Will The Lexus No-Haggle Dealer Experience Work? When the Lexus brand launched in 1989, they had a pretty straightforward objective; give American luxury car buyers a better product and a more customer oriented experience. Now the automaker is taking a big risk in the hyper-competitive luxury market with a haggle-free sales pilot. 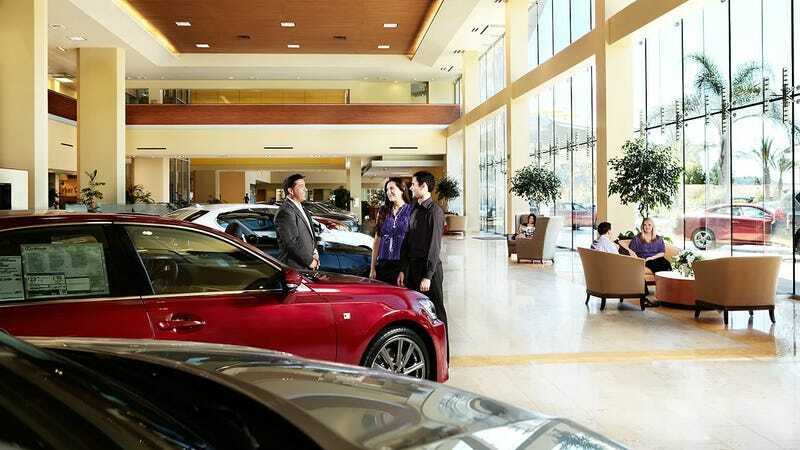 At a major automotive conference in Michigan, Jeff Braken Group Vice President and General Manager of Lexus announced that the brand will begin experimenting with no haggle program in 12 of its 236 dealerships. The theory behind this approach is that millennial car buyers (really most car buyers) hate spending hours at the dealership haggling for a car deal. When you look at the broader picture of the no-haggle vs. traditional approach to car sales, it becomes a bit more complex. I can’t tell you how many times I have heard a car buyer say, “I wish I could buy a car like you buy a Tesla.” Notice how no one ever says, “I wish I could buy a car like you buy a Saturn.” My response to them is, “You can...it’s called sticker price. Everyone buys a Tesla at MSRP.” Of course the major difference between Tesla and other brands, is the Tesla pricing model speaks to the very core of our fear regarding car buying...we don’t want to get ripped off. For so many years the dealerships had the advantage. They had all the information and they could manipulate the numbers all kinds of ways to make sure they made maximum profit from the car buyer. Then the internet changed all of that. Consumers knew what cars should cost; they knew what incentives and discounts they were entitled to. Car buyers with a few clicks and phone calls could solicit quotes from a variety of dealers without ever leaving their home. Even with all this power, many buyers still walked away from their deal feeling like they could have done better. With Tesla everyone pays the same, it doesn’t matter if you are a pushover or a shrewd negotiator, the price doesn’t change. Therefore, the perception is you can’t get ripped off buying a Tesla. Most consumers are uncomfortable with the idea that their friend, neighbor, or relative was able to get a “better deal.” For new cars, this consumer anxiety gave rise to third party shopping sites like TrueCar. Whose old tag-line was “never overpay.” The idea was that if a car buyer had full disclosure of all the prices and new what the “average” price was, as long as they paid below the average they would be happy with their purchase. For used cars the most dominate figure right now is CarMax, though there are others that offer a similar model. We have discussed previously how CarMax’s marketing is specifically targeted at folks that petrified of negotiating the price of a car. CarMax has done very well, and has proven to some respect that people will pay a premium to avoid haggling. Where Lexus may have an advantage is that many luxury car buyers value their time over the best deal. That’s not to say that luxury car buyers are willing to get ripped off, but they are less likely to keep going around and around to different dealers just to whittle down an extra few hundred bucks. Combine a time saving experience with a price that seems fair given the market for that particular car, and Lexus’s goal of increased customer satisfaction in addition to more sales could be realized. The issue arises when the customer thinks they can do better elsewhere. As I mentioned above, the reason the Tesla no-haggle model works is there is nothing to compare it to. If you want to buy a new Tesla, you pay full asking price; it’s just like an Apple product. You want that ridiculous iWatch? Then you have to pony up whatever Apple decides they want to charge you. With cars we have alternatives and often the traditional “haggle” dealership will be the better deal as long as the buyer is willing to work for it. Sometimes the buyer doesn’t even need to work that hard. Even with CarMax it doesn’t take much work to find a better value in the used car market. What is concerning for those twelve Lexus dealers participating in the pilot is that will this be an easy opportunity for their competition to undercut their prices. There is a Lexus car buyer in the NJ/NY metro area, their local store has opted for the no haggle pilot. This buyer calls up their local dealership and asks for a price on a new IS 350 (MSRP about $45,000). The dealership offers a “no-haggle” price of $42,000. This buyer can either accept that no-haggle price, or they can spend about 3o-45 minutes calling all the other Lexus dealers within an hour drive to see if they will offer a lower price. This method doesn’t even really involve “haggling.” In fact, it isn’t much different than how most consumers would shop for a product online. The two other Lexus dealers in the area now that they are competing against the no-haggle store. All they have to do is offer a lower price. So both dealers offer the same $45,000 IS350 for $41,000. With a few quick phone calls, that Lexus buyer just saved a grand and didn’t have to haggle at all. The no haggle dealership lost the sale and word starts to get out that better deals can be found elsewhere. It call comes down to margins, or how much more is left in the deal. The issue that a lot of buyers have with no haggle dealers, is they believe these stores aren’t really giving their rock-bottom price. The consumer gets suspicious that they are leaving money on the table by going with the haggle-free deal. Without a 100 percent commitment from all dealers to adhere to this model, these scenarios are likely to do damage to the no-haggle program. What these Lexus dealers need to determine is how low they are willing to go. In that hypothetical situation, if the no-haggle store offered the IS350 for $41k, knowing that every dealer buys the car for pretty much the same cost and that $41,000 is the absolute lowest price that car can be sold before taking a loss, then it is likely the customer would probably have come back even after calling around. This approach is great for buyers, but might not be a great proposition for dealerships. It all comes back to how the salespeople are compensated. If you have a commissioned sales staff whose income depends on how much profit they make from each unit sold, a serious reduction in those margins could mean a loss of talent. When a Seattle Honda dealership tried this approach they saw an immediate loss in staff. One solution is to pay your sales staff a salary like Tesla does. Though the Tesla sales staff at their stores has been received with mixed reviews. Even on salary many of the top performing sales people will may leave for more lucrative opportunities. As a buyer you may not be concerned as to whether or not the dealership loses staff or the salespeople make less money. All you care about is the best deal with the leas amount of hassle. What you don’t want to encounter as a luxury car buyer is a dealership with a high turnover rate. This reduces consistency and customer satisfaction, the very thing Lexus is trying to improve. In order for a haggle-free model to be beneficial to all parties, the dealership is going to have to restructure their compensation philosophy. Usually this means some type of combination of salary and commission for number of units sold and perhaps additional incentives for high customer satisfaction scores. What these haggle-free dealerships should consider is a level of service above and beyond their competition. Braken mentioned that online purchasing is in the works, but customers would still have to come to the dealership to take delivery. Some luxury car dealerships will deliver cars to the customer, though this service is usually reserved for only the high-end buyers. However, if a Lexus dealer combined haggle-free pricing, with online purchasing and a complimentary concierge service on any vehicle that is bought or leased, that would be very appealing to the majority of luxury car buyers. As of know Lexus is sparse on the details as to how exactly this pilot will be implemented. If done correctly and carefully, it could be a major step in changing the way we buy cars. On the other hand, if expectations are not managed properly those twelve dealers will most likely return to the “old way” of selling cars.